It’s a good thing I can count books I read for school, because I’m a bit behind on my 50-Book Challenge (but not too much–if I managed to pop out 3 more books by the end of this month, I’d be about right on track. But that is not looking too likely at the mo…). 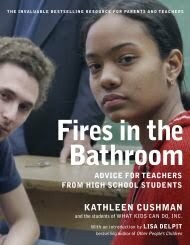 Fires in the Bathroom is a collection of bits of advice given to high school teachers from a group of high school students collectively known as What Kids Can Do, Inc. The goal of this advice project was to give high school students (esp. minority students) a voice in the public education system. The students were paid for their time and responded to questions ranging from “How can a teacher most effectively teach difficult material?” to “Must teachers like students?” The students’ responses were honest, at times humorous, but overall thought-provoking; when I first got this book to read, I figured that students would just say that teachers should never give homework and make school as easy and painless as possible, but the students actually didn’t say hardly anything along those lines. On the contrary, most recognized the value that school could hold for them and wanted the best education possible from well-trained, caring instructors. While full of all sorts of good points, I found that often the students’ advice conflicted with each other. It seemed that the students wanted their teachers to walk perfectly the line between being authoritative and a friend, being challenging but not too demanding, being engaging but not “trying too hard.” I found that in some ways, the book only worsened my biggest fears about becoming a teacher; one thing I’ve always worried about is being able to reach each student, and this book only seemed to make the task appear ever more daunting. However, I did find a lot of the suggestions useful, and I think I’ll keep this book to read again when I actually am in the thick of teaching on a high school level. In addition to advice, the book contains sample questionnaires, checklists for teachers, and reflective worksheets to give to students (and to fill out as teachers).